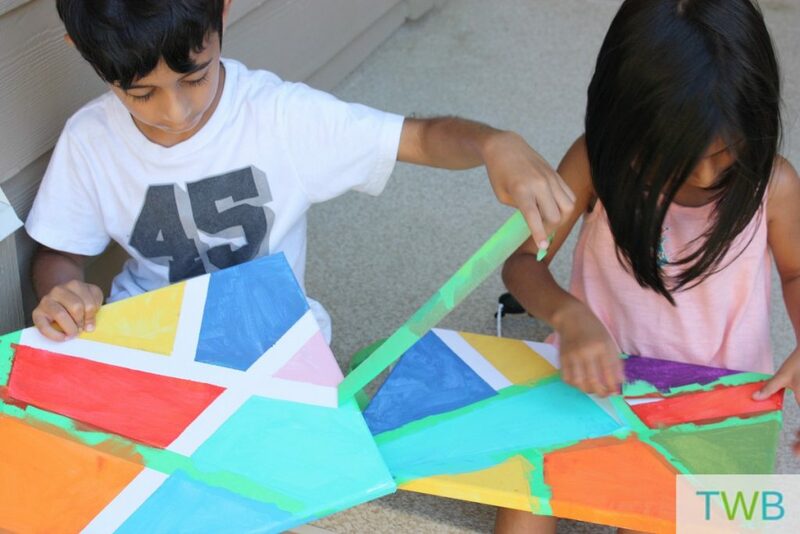 In the summer, we try and do one new craft or creative activity each week. Last week it was these super fun and cool DIY Lava Lamps. 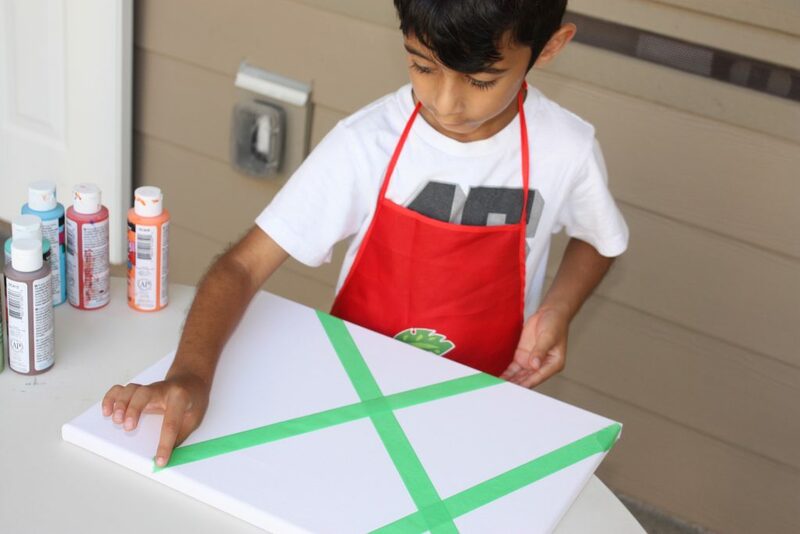 This week we are getting a little traditional and painting, just with a little twist, Tape Painting. 1. Set the kids up with smocks, paints and brushes. 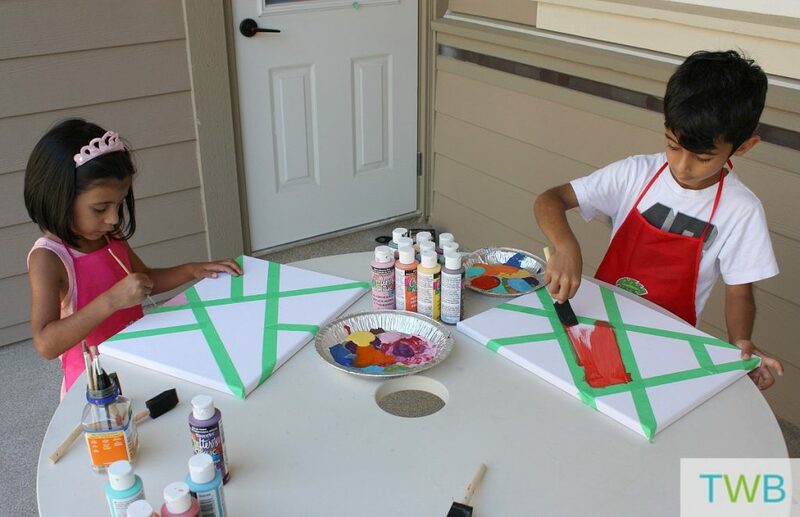 Put the canvases on a flat surface and grab the painters tape. 2. 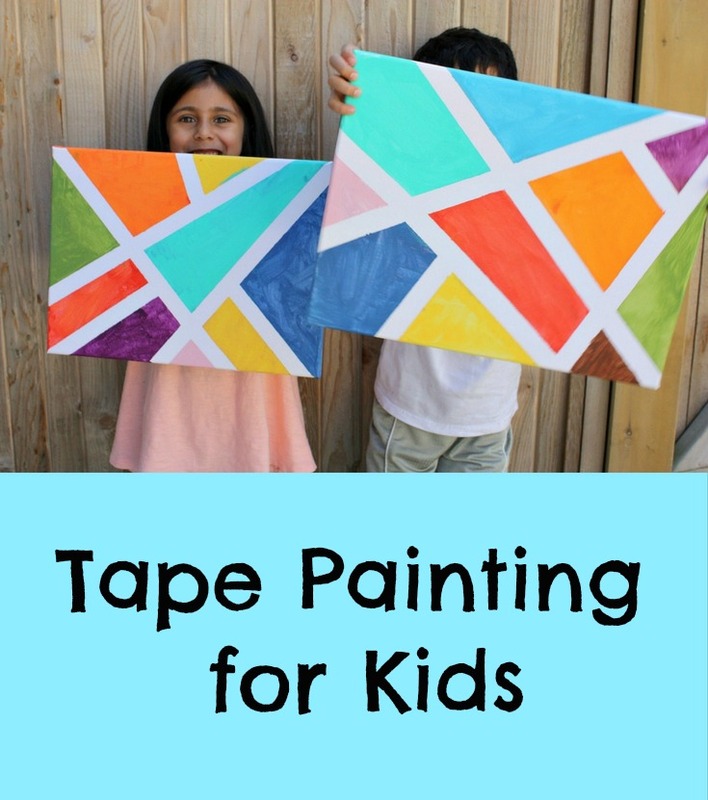 Give the kids pieces of tape, one at a time, in different sizes. Let them place the tape on the canvas at different angles. Make sure the tape is long enough to go over the edge of the canvas and ensure that it is completely flattened on the canvas so no paint gets underneath. 3. 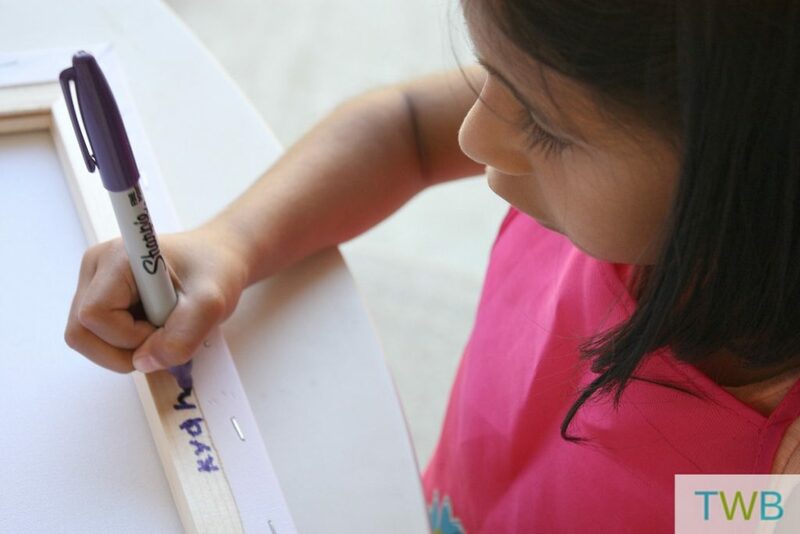 Before painting, flip over the canvas and let the kids write their names and the date on the back border. 4. 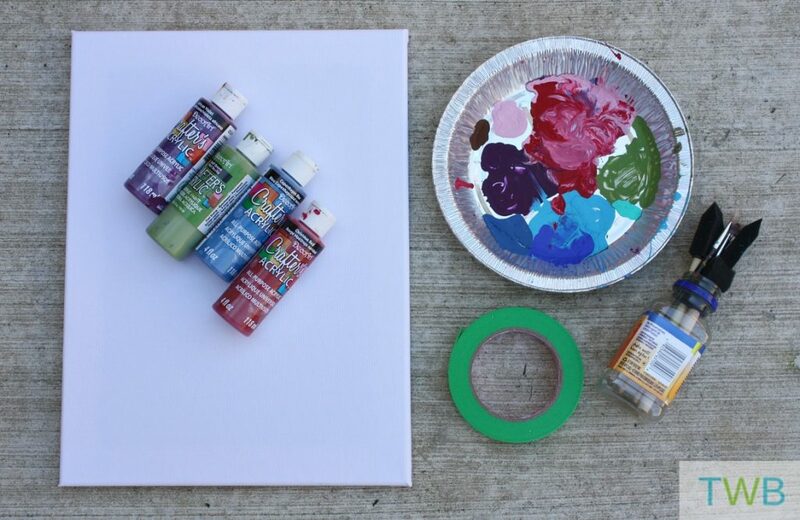 Next the kids can pick out their favorite colors and pour them into the painting tray. Then let the kids get creative, brush and sponge painting on the canvas. We chose to paint each section a different color but you can do whatever your creative heart desires. 5. Make sure to let the paint dry completely. Once it is, the kids can slowly peel off each piece of the tape. Then voila, the perfect wall art! My daughter hung her’s in the hallway and my son hung his canvas in his bedroom. 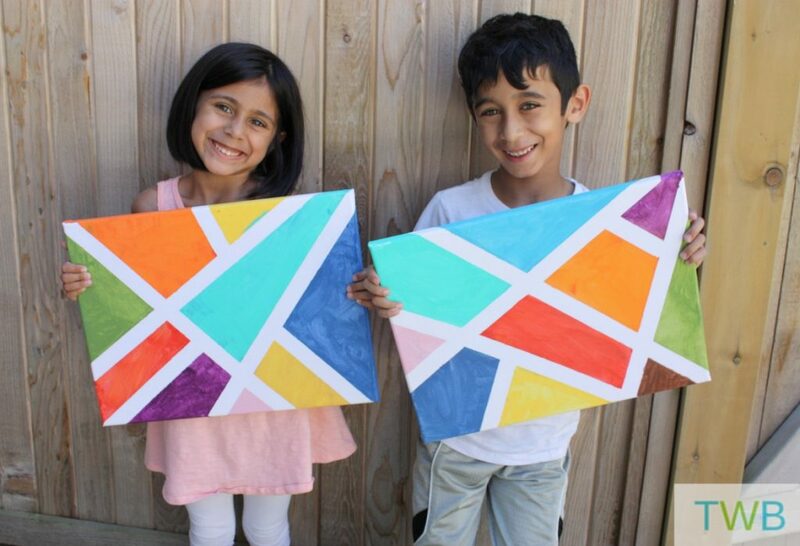 For more fun summer art projects, check out my 8 Fun Summer Crafts post. I recently saw a video where a girl painted her bedroom using tape painting! It is some tedious task! but making wall hanging is a super cool idea. It’s quick, easy and cost efficient. Thanks for the tip. I hope your kids enjoyed the process. Great idea! I am always looking for craft ideas to do with my 5 years old and this is just perfect for her. Pinning this..
That’s great Priya, I hope you guys enjoy it. Oh wow! These look great. I saw a $300 one from CB2 with the tape painting which I really loved. I’m sure it’ll be fun when you try it!